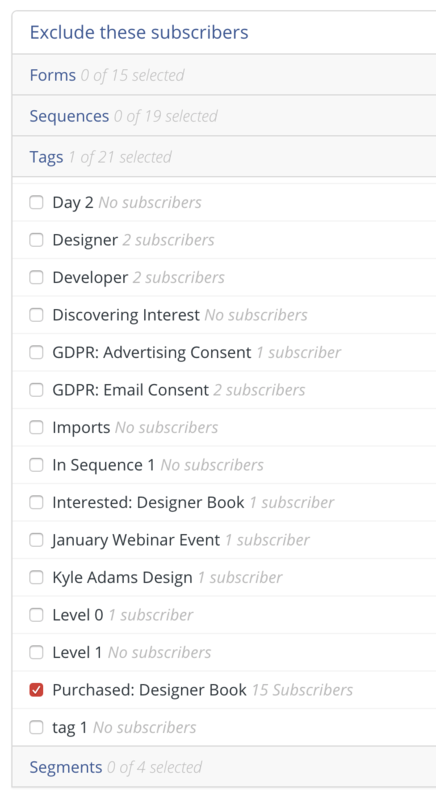 One of the unique features of the ConvertKit Sequence builder is the ability to have those Sequences go to specific Subscribers. Connecting your Sequences to your Forms is the best way to make sure the right people get those Sequence emails. That said, from time to time, you may have Subscribers you want excluded from a certain Sequence. For that, we've created the exclude function in your Sequence Settings. Note: This feature is for excluding Subscribers (keeping Subscribers from getting the course). If you move forward with Exclusions, the selected Subscribers will not get your course. When you go to any of your Sequences, and into the Settings tab, you'll this this page. By default, Exclusions are set to zero (0), so only make changes if you want to keep people from getting your Sequence emails. You're running a Sequence to promote a product. Once a Subscriber has purchased that product, you don't want to send them any more promotional emails. 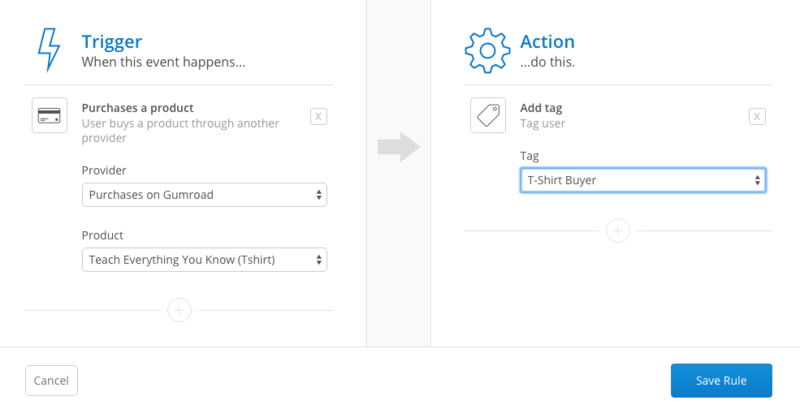 And your t-shirt buyers will not get the rest of the t-shirt promotion Sequence once they have that Tag (after they've purchased). You want to build on an existing Sequence without sending those new emails to people who have already completed the Sequence as it was. And then mark the Tag as an Exclusion just like the example above. You have two Sequences running at the same time and you want to make sure a Subscriber only gets one of them. Let's say you have a few courses that your Subscribers could sign up to all running at the same time. 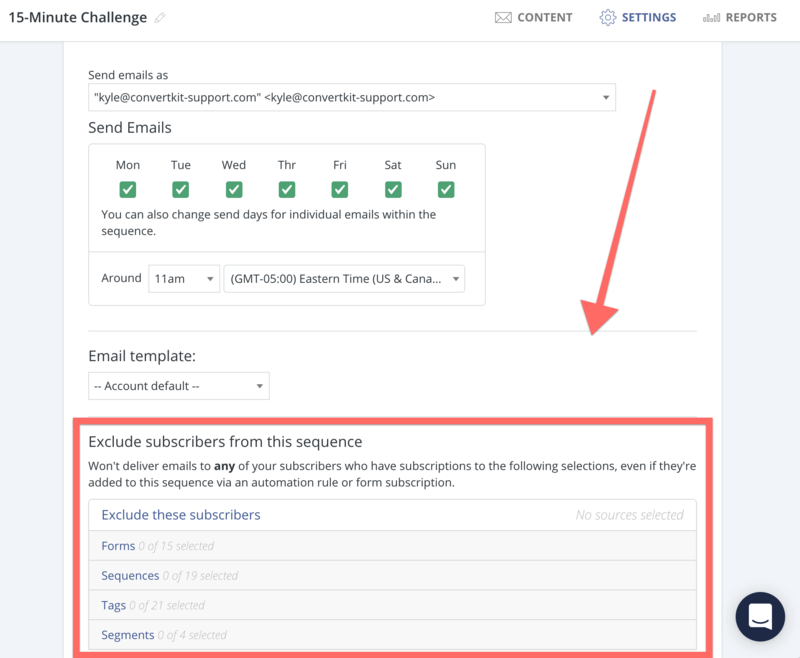 While ConvertKit will catch a Subscriber signing up to the same Sequence twice and only send it once, you'll want to use the exclude Subscriber feature inside your Sequences to make sure Subscribers to Sequence A don't also get Sequence B, and vice versa. Use caution when using this method as Subscribers who are opted into both Sequences will not receive either if you do this. So be sure to add the Exclusion rules to the Sequence that has less value to you. 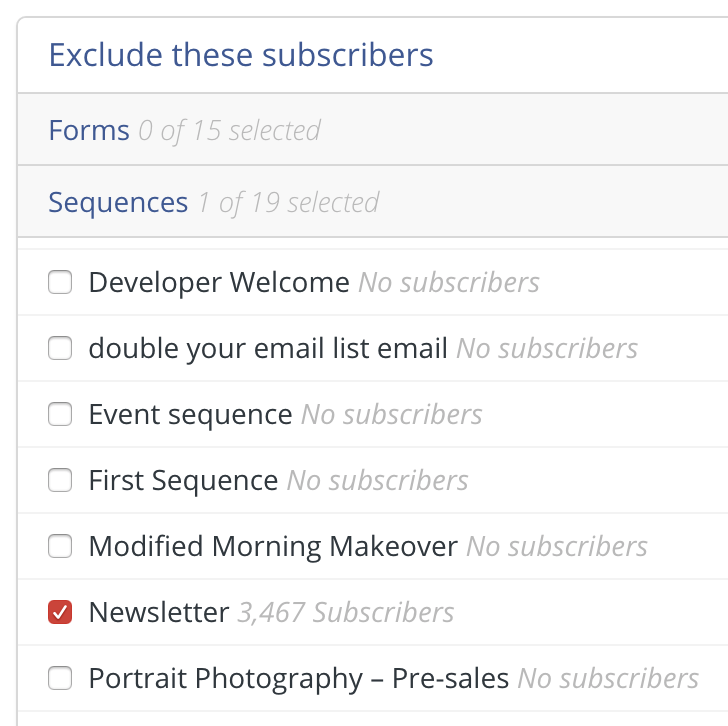 If you're finding that your Sequence emails aren't sending to your Subscribers, check the Exclusions. You'll see a number at the top of the box that says "X sources selected" to give you an idea of how many Exclusions are laid out for that course. If the Subscribers that aren't getting the Sequence emails are included in the Exclusion, that explains it.